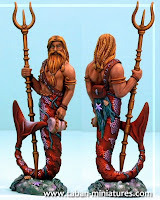 The Nauticans are an army for use in Warhammer Fantasy Battle games. you can now leave comments here or in the Fantasy Battle Forumthis Warhammer army is unofficial and in no way endorsed by Games Workshop Limited. Army designed by Sigmar from Battle Reporter. Well folks, we made it to the first downloadable draft version of the army list. Thank you to everyone in the Warhammer Fantasy Battle community for helping to make this happen. This draft is to encourage some play testing and feedback. The army is not yet the finished article but we think it's getting very close. Note: you will need a valid email address to join the forum (which only takes 2 minutes) but don't worry you will not be spammed and nobody will ever find out your email address. We typically send out 1 forum newsletter every 4-6 weeks and you can unsubscribe in the user control panel if you want to. Kiwi and Joel the army's main supporters, Gareth Pannan for the artwork, Tizz, scurrdi, Zombie, Gurth and Brett (from battlereporter.freeforums.org) and Beast, GreenGiant, Kyte & Hexentanz (from Warhammer.org.uk) and 40kentusiast & LtCraggs (from dakkadakka.com) and a variety of people from other forums. also, thanks to Reaper Miniatures, Inc (http://www.reapermini.com/) and Dragon Rune (now owned by http://armorcast.com/), Freebooter Miniatures (http://www.freebooterminiatures.com/) and HydraMiniatures (http://hydraminiatures.com) who have all kindly allowed me to use images of their minis.